There are a lot of strikeouts in today’s game. The most ever, in fact. If the season were to end today, the league’s 22.4% strikeout rate would represent an all-time high, eclipsing the record set in 2017. That record from 2017 surpassed the one set in 2016, which itself surpassed the one set in 2015, which surpassed the one set in 2014. Ever since 2008, actually, baseball has produced a new strikeout record, and there doesn’t seem to be an obvious end in sight. With all those strikeouts come a lot of opinions on how to reduce strikeouts. The latest set of proposals come from Tom Veducci at Sports Illustrated. Verducci correctly places blame/credit for the strikeouts with the pitchers, where it belongs, and he suggests a few solutions: lowering the mound, limiting the number of pitchers on an active roster, and introducing a pitch clock. I find it curious that Verducci omits any mention of the strike zone itself. I have previously proposed raising the bottom of the strike zone to put more balls in play, but there are others — including at least one MLB manager — who believe that a larger strike zone might increase the number of balls in play. The possibility of this effect is one I’ve heard mentioned on broadcasts before, so it isn’t without precedent. The theory goes like this: an expanded strike zone will force batters to exercise less patience and, as a result, swing at more pitches. More swings, and perhaps more emphasis on contact, means more balls in play. Fortuitously, this is a theory we can test, because the strike zone actually hasn’t remained static in recent years. In fact, thanks to great research by Jon Roegele, we know exactly where the strike zone has gotten bigger. 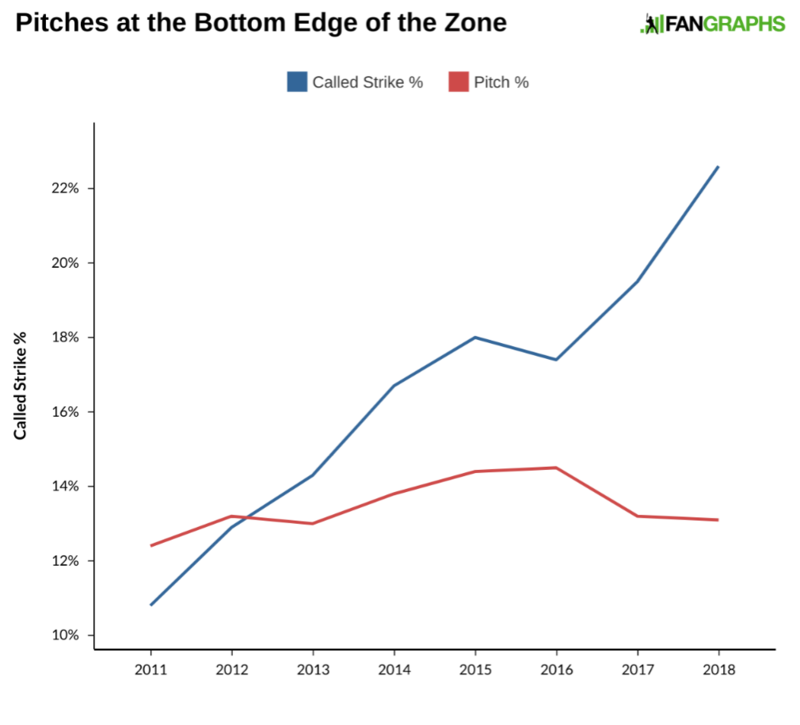 The very bottom of the strike zone has increased considerably over the last decade, and although it got slightly smaller the last couple seasons, the trend has reversed itself this year. 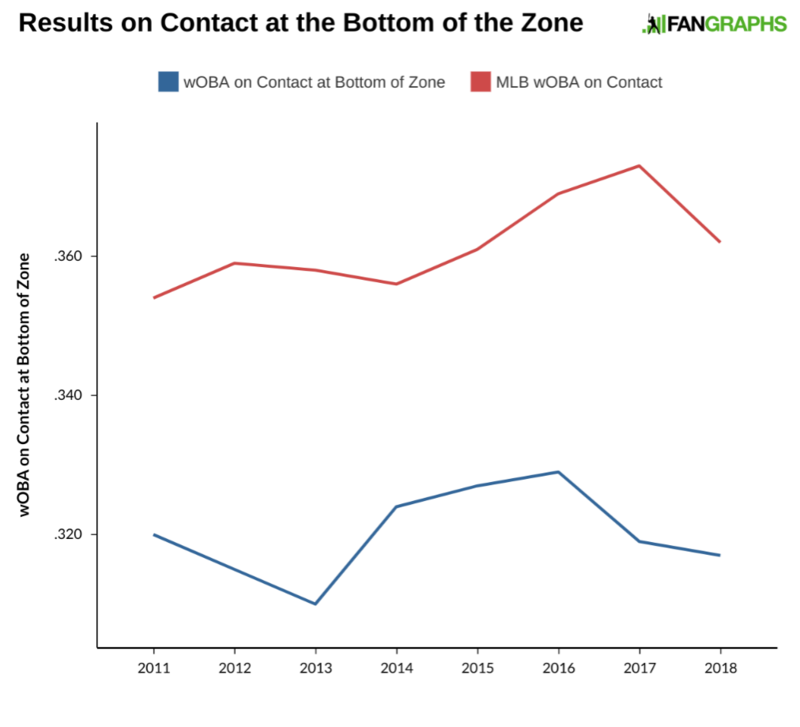 Even if there wasn’t an increase this year, the strike zone would still be substantially larger at the bottom of the zone than it was a decade ago. The bottom of the strike zone is falling again this season! To see how these changes altered the behavior of hitters and pitchers, I ran a number of searches over at Baseball Savant using their detailed zones option. The zones look like this, with the green box approximating the strike zone. 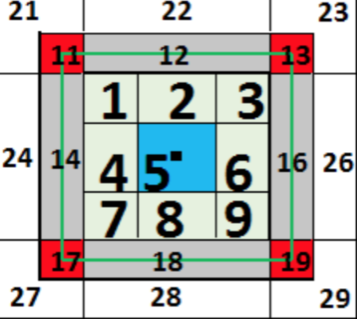 I wanted to focus on the area where the strike zone got bigger, so I used zones 17, 18, and 19 as a proxy of the bottom of the zone. 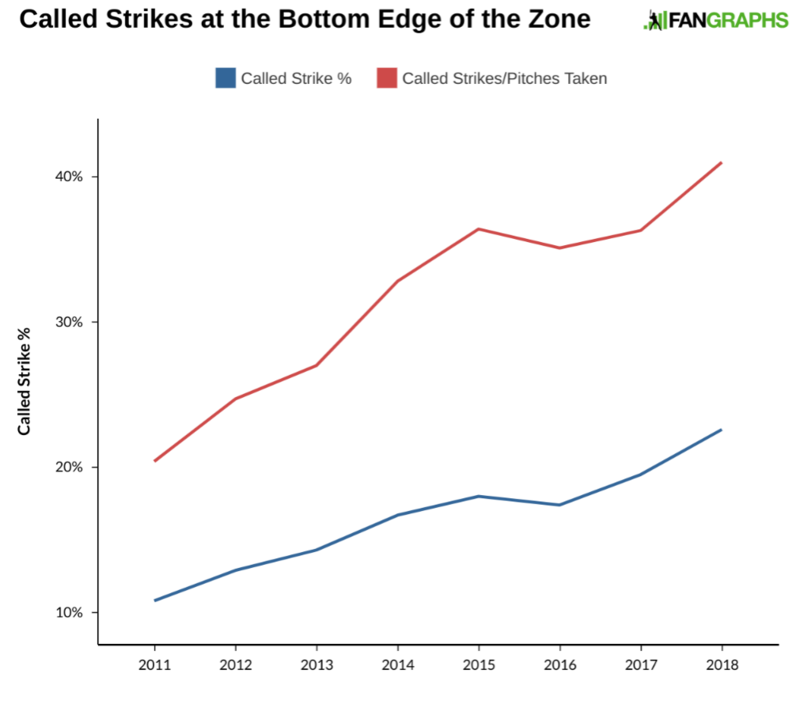 I used data from 2011 through 2018, and to make sure I was getting the zone right, I looked at the number of called strikes in those zones as well as the number of called strikes compared to pitches taken. Over the last eight years, the number of called strikes and the number of called strikes as a percentage of pitches taken have both roughly doubled, so we do indeed have a decent approximation of the area where the strike zone has increased. Before we get to a possible change in hitter behavior, let’s look at how the pitchers have adapted. During the early part of the decade, as called strikes went up, so did the frequency of pitches. One year after the first decline back in 2016, the frequency moved down, but it doesn’t appear that pitchers have taken advantage of the expansion this season. They’re still pitching low in the zone more than they did at the beginning of the decade. In 2009, the pitch frequency was just 11.5% compared to over 13% this year. We see that pitchers tend to alter location as the strike zone itself is altered; the relatively consistent walk rates throughout baseball history seem to speak to that trend. But how have hitters changed their behavior in reaction to the expanded strike zone? The chart below shows the swing percentage over the years. 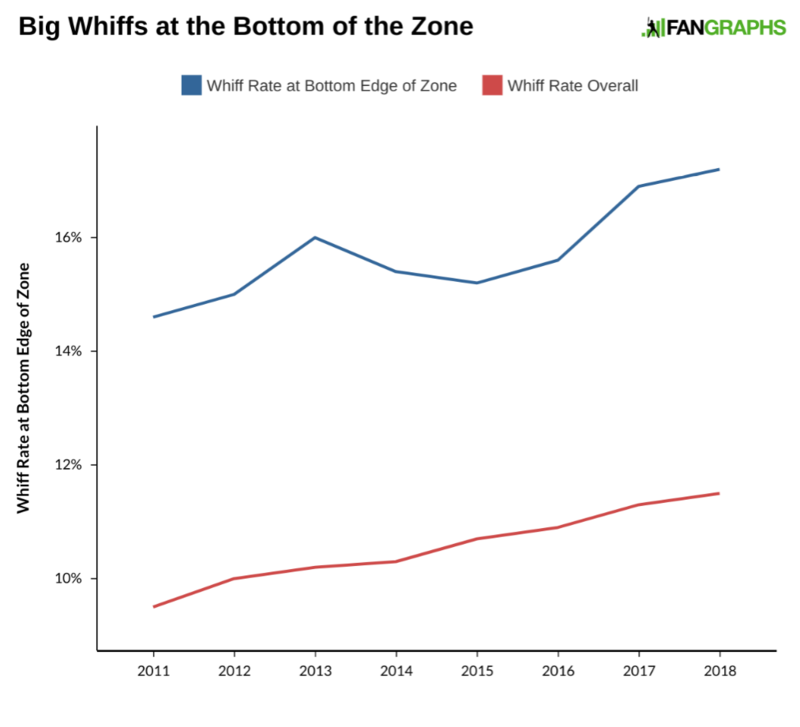 What this indicates is that, with the downward migration of the zone, swing rate did rise — for a little bit, between 2013 and -16 — before falling again. Even these increases aren’t that significant, though, and the result doesn’t appear to be many more balls in play. Taking the greatest increase in swing rate, about a 3.6% change from 2011 to -16, we can actually estimate the increase in balls in play. The increase in swing rate at the bottom of the zone during this period equates to about one extra swing per game. Of those extra swings, only about 40% lead to batted balls, with whiffs and fouls accounting for the rest of the them. The expense is that, for every three swings, you get a whiff, a foul, a ball in play and nine balls turn into strikes, which might negate the chance that a ball goes in play on that one extra swing per game. In addition, if pitchers are pitching more at the bottom of the zone instead of closer to the middle of the zone (and they will), swings are taken away because hitters swing at a much greater percentage of pitches when they are even just sightly higher in the strike zone. There’s a roughly 66% swing rate in zones 7, 8, and 9 above. So why wouldn’t hitters swing at such a pitch, even if it’s more likely to be called a strike? Because these aren’t good strikes. The graph below shows the whiff rate on pitches at the bottom edge of the zone compared with the whiff rate overall. These pitches are hard to hit, and even when contact is made, the results aren’t that good, as the graph below shows. Hitters aren’t given much of an incentive to offer more frequently at pitches at the bottom of the zone because good things tend not to happen there. Batters swing and miss a lot more, and even when they do make contact, the results are worse. The same holds true for batting average, as well. Increasing the strike zone for hitters just leads to more bad results, and because pitchers are so good, it would lead to fewer good pitches to hit. We have some evidence of this occurring elsewhere in the zone, as well. In his research, Roegele notes that the away edge of the strike zone to lefties has decreased by a considerable margin over the last decade. It should not come as a surprise that pitchers throw fewer pitches there than they used to. If the goal is to facilitate more balls in play, pitchers need to be forced to adapt. The strike zone exists because those are the pitches most likely to be hit. The edge of the strike zone and outside the strike zone gets fewer swings not because those pitches are balls or are more likely to be called balls, but because those pitches are much harder to hit and much more likely to result in a swing-and-miss or weak contact. Expanding the strike zone would only lead to more whiffs, more weak contact, and fewer hittable pitches. If there is an adjustment to be made to the strike zone, it should be to make it smaller to get fewer strikeouts and more swings and balls in play. Pitchers have shown they will adapt, negating the risk of more walks. We might also see an increase in offense that doesn’t require the help of a juiced ball. Pitchers are too good, already. They don’t need any more help. We hoped you liked reading A Bigger Strike Zone Is a Bad Idea by Craig Edwards!